Sometimes, it is hard to follow through with a set fitness schedule due to being so busy or lack of motivation. 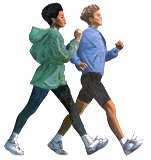 However, even something as simple as taking a walk around your neighborhood does help with Calorie Burning. Try to choose simple but better alternatives that will help you to be somehow active . For example, take the stairs instead of the elevator, if your destination is less than a mile, don't drive, just take a walk there, Dance to your favorite tunes. Do you see where I am going with this? You don't have to conform to vigorous activities to lose weight. You just have to be active on a daily basis. Love this! you must have been reading my mind. My husband and I were just talking and both agreed to start walking together daily. We have a lovely bike path in the area in which we live, so we figured to put it to good use. I also have recommited my self to getting back into my fitness bike :) Thanks for sharing this great post:) take care. Hey Zainab, that's awesome. I always resort to walking when I get tired of workouts. It is ver effective. Take care.